Back in 2008, Sam Parker of the USIP proposed a highly useful analytical perspective for studying factionalism in “the new Iraq”, emphasising above all the distinction between the parties that are in control of the state apparatus (“the powers that be”, PTB) and those that have only limited access to state assets (“the powers that aren’t” or PTA). Among other things, the PTB/PTA distinction was helpful in making sense of how political parties that had only limited commonalities in terms of ideology – KDP, PUK, ISCI, Daawa, IIP (but not the rest of Tawafuq) – nevertheless closed ranks against outsiders in an attempt to hold on to power. It was particularly useful in explaining why mostly anti-federal parties like the Daawa and IIP hung on to their alliances with the decentralisers among the Kurds and in ISCI. Nonetheless, on a number of occasions in 2008, ideology disturbed or even trumped the power relations that inspired the PTB/PTA dichotomy. This was seen to a considerable extent during the debate on the provincial powers law and the election law, when some Daawa and IIP elements joined Iraqi nationalists in the opposition to propose measures in Kirkuk that were perceived as centralist and anti-Kurdish. It also happened in a more dramatic and decisive fashion in the period leading up to the local elections in January 2009, when Nuri al-Maliki broke free from his pragmatic marriage with the Kurds and ISCI to successfully contest the elections on an explicitly centralist platform. As Iraqi politics enter its final phase before the 2010 parliamentary elections, the PTB/PTA dichotomy is once more proving its usefulness in helping to explain alliances that are unrelated to ideology (or that even contradict the sphere of ideological politics entirely). Importantly, however, there are today certain changes to the line-up of the powers that perceive themselves as being in control of state assets. In particular, after its influence south of Baghdad was challenged by Maliki’s “support councils” before the last local elections and the new Daawa-led governorate councils that were subsequently formed, ISCI is increasingly seeing itself as a disadvantaged party. This situation in turn has opened up for dialogue with ideological enemies like the nationalist Iraqiyya. The IIP, too, is increasingly seeing itself as a party on the sidelines and has spared no effort in criticising Maliki’s centralisation of power. The most concrete expression of this new tendency is an emerging debate on a so-called law on election conduct. The proposal, to be debated once the Iraqi parliament resumes its business on Sunday after another extended holiday, mostly contains measures designed to guarantee the integrity of the elections and that will come across as uncontroversial as such. However, one item has already provoked considerable debate: A suggestion to transform the current government into a “caretaker government” in the period leading up to the elections, effectively restraining its power to spend money freely. This is a clear attempt to curb the power of Nuri al-Maliki to use ministries under his own control to further electoral aims. In other words, this seems like another PTA/PTB clash, albeit this time with a slightly different party configuration. Reactions to the proposal have been mostly predictable: It has been supported by ISCI, IIP, Iraqiyya (some of whom even propose it be bundled with the 2010 budget, the other big issue right now, to ensure its passage); it has been blasted by Abbas al-Bayati and Ali al-Allaq, who are Maliki loyalists. The response by Fadila – that the law is unconstitutional because it has been copied from previous legislation governing the Iraqi elections commission – is at least unsurprising for its idiosyncratic character. Only the Kurdish reaction has been a true surprise: Several Kurdish parliamentarians have criticised the proposal for being “unconstitutional”, although a definitive stance has yet to crystallise. Why are the Kurds, who used to be critical of any hint of centralism on Maliki’s part, apparently siding with the Iraqi premier in this case? To understand this, we need to understand the origins of the proposed law. It originated in fact as a “document” (waraqa) on political conduct several months ago (it was publicly known at least on 8 November, when an article in Al-Adala, controlled by Adil Abd al-Mahdi of ISCI, referred to it). And its authors are in fact the Iraqi presidency council, headed by Jalal Talabani of the PUK. But in the meantime, possibly in an attempt at finding prospective post-election partners, Maliki has initiated a tentative dialogue with the Kurds, and it is possible that the Kurds are now reciprocating by standing by their PTB ally, despite having originally signed off on the proposal through Talabani. A number of issues are raised by the proposed law. Firstly, how can the Iraqi presidency constitutionally introduce a new law? Usually legislation is dealt with in a dialogue between the cabinet and the legislature; the role of the presidency council is normally to approve or veto. Secondly, and disturbingly, Mahmud Uthman of the KDP has said parliament will “decide” on the constitutionality of the proposal on Sunday. Isn’t that the job of the constitutional court? Finally, with regard to the sustainability of any new alliance between Maliki and the Kurds (these two together control two out of the three parliamentary presidents and can probably obstruct the whole initiative if they want), two scenarios stand out. On the one hand, if Maliki uses the opportunity to obtain meaningful concessions from the Kurds on key constitutional questions he might emerge as a figure who is capable of doing business with the Kurds in a balanced way. On the other hand, if he surrenders entirely to Kurdish demands, he is likely to meet with resistance even from his own Shiite Islamist base, where anti-Kurdish sentiment has been running high for some time. In other news, the IHEC has warned against public campaigning before its certification of the candidates is complete. Some news has leaked, however: Some current representatives in danger of losing their seats under the new open list system have been moved to symbolic constituencies. For example, Jalal al-Din al-Saghir of ISCI will stand for election in Dahuk (a Kurdish-majority governorate) and now openly admits that his only realistic chance of winning a seat is under the quota for compensation seats. Reactions to the Occupation of Fakka: A Barometer of Pro-Iranian Sentiment in Iraq? OK, so it was Friday, and a day off for most Iraqi journalists. For many hours we had to rely solely on Western newswires for information about the astonishing occupation by Iranian soldiers of an oilfield called al-Fakka on the Iraqi side of the border with Iran in the Maysan governorate. And in the end, also Iraqi news agencies did begin publishing the reports, even if half a day had lapsed before they really got going. Perhaps the most interesting aspect of this little episode – and one of the few things that is possible to analyse without getting bogged down in speculation and conjectures – is precisely the reaction, or lack of it, by Iraqi media. Not so much what writers affiliated with Iraqi nationalists and secularists say – they were predictably scathing about both the Iranian occupation and the rather limited, belated and at times confusing official response by Baghdad. No, the interesting thing is what media close to the leading Shiite Islamist parties said. On the one hand, the Buratha new agency, supportive of the Islamic Supreme Council of Iraq (ISCI) and in particular close to Jalal al-Din al-Saghir, one of its more radical preachers, for a long time (i.e. well into Saturday) said absolutely nothing. Then it had a story to the effect that Jalal al-Din al-Saghir said the rumours of the occupation were lacking “corroboration”, before adding a report that the Iranians were denying having ever entered the disputed area. Today, around midday, it reported on how the Iraqi and Iranian foreign ministers had been in touch regarding the “misunderstandings” concerning Fakka. A similar lack of concern was expressed at the Nahrainnet website, which is frequently mislabelled a “Sadrist” website but in reality seems more like an Iranian-inspired pan-Shiite website that seeks to bring ISCI and Sadrists together over issues like support for the Huthis in Yemen (conversely the more genuine Sadrist website Al-Amara had a more critical angle on the occupation; the Iraq News website close to Ismail al-Waili, the brother of the ex-governor of Basra with past ties to Fadila, condemned it). 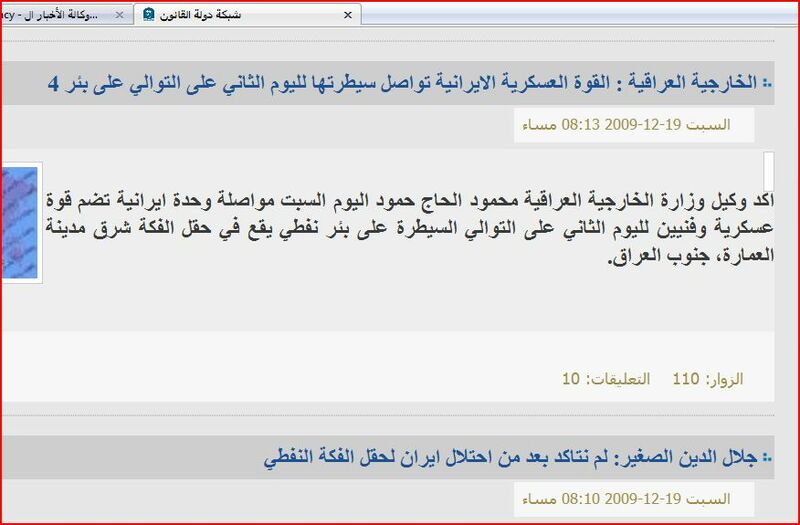 Things looked a bit different at the State of Law website, which is sympathetic to Prime Minister Nuri al-Maliki. Here, too, there was a long delay. However, towards the evening on Saturday it did publish a report in which the Iraqi foreign ministry confirmed that the Iranians had seized Fakka. Not only that, the website editors juxtaposed this item to a copy of the report from Buratha in which Jalal al-Din al-Saghir seemed to deny the incursion. Meanwhile, the US ambassador in Baghdad, Christopher Hill, sounded bullish about the emerging Iraqi official reaction: “It does speak to the overall view here that they are not going to be pushed around by Iran.” This seemed like an echo of his predecessor, Ryan Crocker, who never tired of telling us that the anti-Iranian stance of Iraqi Shiites during the war in the 1980s constitutes a veritable guarantee against excessive Iranian interference – never mind that Crocker focused his Iraq diplomacy precisely on those Shiites and Kurds that fought on the Iranian side, like Abd al-Aziz al-Hakim and Masud Barzani. But these days Maliki and not the Hakim family seems to represent the focus of attention for the optimists in Washington, and given the slightly more critical perspective on the Iranian operations on the State of Law website, maybe Hill was right? Until there is a more persistent pattern of Iranian transgressions, episodes like the Fakka incident ultimately serve as political theatre that will deflect attention from the more fundamental question about Iranian influence – at the level of high politics in Iraq, and through a constitution that works in Tehran’s best interest. In that perspective, Hill’s reaction is reminiscent of the way Crocker and General Ray Odierno spent a disproportionate amount of time tracking weapons smuggling from Iran while at the same time continuing to dine with pro-Iranian leaders like Hakim. We can only speculate about the possible explanations for the Fakka occupation itself, which may range from everything like local issues in the Maysan area via internal disagreements on the Iranian side of the border to the possibility that Tehran would like to test Maliki on the eve of his visit to Cairo. Far more important, for internal Iraqi politics, is probably how the Hakim–Maliki relationship continues to evolve over the coming months. It has been a confusing couple of weeks for everyone who is trying to spot a US strategy in Iraq. This is especially the case when it comes to the north of the country: First, during the debate over the election law there were unusually loud complaints by the Kurds about “US pressure” being exerted on them. Conversely, more recently, a group of some 85 nationalist parliamentary deputies have signed a protest against alleged American “promises” to the Kurds. This is reasonably neutral since articles 140 and 142 of the constitution theoretically cancel each other out: 142 on constitutional revision (the focus of attention of many nationalists) can be used to invalidate 140 on Kirkuk (which is preferred by the Kurds). The subsequent paragraph about the need for a census in order to hold local and parliamentary elections in 2013 and 2014 seems a little strained since it is the first time the Obama administration appears to express any particular concern about what the details of Iraqi politics will look like in such a distant future; nonetheless, while one may well suspect that the underlying intention is to reassure the Kurds (who want to have a census as soon as possible because of 140), the statement as such is still impeccably neutral. No DoD version of these events appears to be available, and the way in which the Kurdish media spun the first White House statement out of every possible proportion does not inspire confidence. Nonetheless, this is a quote, and the Americans have not distanced themselves from it. Here there is no mention of 142 at all, and the census is referred to with a 2010 timeline: Both of these will be welcomed in Arbil and will raise eyebrows in Baghdad, especially the former. So UNAMI “reaffirms” that the Kurds meant the law was only for the 2010 elections? That really is a strange statement. If it is merely a case of UNAMI taking note of the Kurdish position then it is so inconsequential that it seems out of place in an official press release. But if it signifies UNAMI sympathy with this stance, then it is problematic, since nowhere in the law or the amendments is there any limitation with regard to the applicability of the law for future elections. It is noteworthy that the idea of limited applicability did form part of a previous US statement on the elections law back in October, but that statement, too, was highly problematic, chiefly because it failed to realise that it was above all the composition of the next Kirkuk batch of deputies that was at stake. And even if the words “no precedent” from the American statement somehow did make their way into the final version of the bill, they did so only in a qualified way: The elections will not serve as precedent before the completion of any investigation related to “unnatural population growth”. Ironically, of course, at the time this language was intended to mollify Iraqi nationalists; it is now apparently being evoked in order to reassure the Kurds. Some observers say Washington is just desperate to stay out of potential trouble in Iraq, especially before the elections, and may have found it necessary to console the Kurds a little because of the reduced proportion of Kurdistan seats in the next assembly. Nonetheless, it is remarkable that people like Gates do not appear to understand that by doing so they are repeating the mistakes of the Bush administration: By choosing to cajole those with the most radical demands and agendas in the Iraqi constitutional process, they are systematically fanning the flames of extremism instead of promoting compromise. Surely Washington had already seen how Masud Barzani had painted the perfectly neutral first White House statement as a “historical victory” for the Kurds? Did they not realise what he would do with the second, and less neutral statement? Such reassurances to Barzani are an exact parallel to what Bush did with Abd al-Aziz al-Hakim in 2005, when he thought Hakim represented all Shiites with his radical federalism scheme. At a critical stage of the constitutional negotiations, Bush telephoned Hakim because of concern about the direction the constitution was taking – and thereby achieved absolutely nothing except to boost Hakim’s ego. A very similar situation can be seen in Kurdish politics: Barzani is in reality but one of several players, but consistently the one with the most radical demands – and also with a past record of consistently creating false and exaggerated expectations among his followers about what they can realistically hope to achieve in negotiations with Baghdad. Currently his party, the KDP, is critical of its rivals, the PUK, and what is seen as a failure by the latter to properly defend Kurdish interests in Baghdad. Conversely, researchers familiar with the situation in Kurdistan say other Kurds take a different view and tend to see the KDP as a radical relic of the past, based partly on tribal values and partly on almost cultish sentiment related to the peshmerga era. For its part, by creating the impression that Barzani has once more gained something – however fictional that interpretation of US policy may turn out to be – Washington is making a compromise over disputed issues in Iraq a lot more difficult to achieve, not least since this latest “triumph” will feed directly into the internal Kurdish political process in the upcoming parliamentary elections. The second licensing round for Iraqi oilfields was carried out by the oil ministry in Baghdad over the weekend. On the one hand, the contracts won by foreign companies will prove controversial because Iraq remains in the middle of a chaotic process of political transition and has yet to agree on a legal framework for the oil sector. At the same time, however, the relatively straightforward nature of the technical service contracts under offer as well as the emerging broader picture of a reasonably balanced mix of foreign and Iraqi participation in developing the country’s oil sector mean that these deals are on the whole less vulnerable to criticism than those previously entered into by foreign companies on extremely lucrative terms with the Kurdistan Regional Government – and therefore also stand a greater chance of surviving in their existing form in the long term. On the whole, the mostly unsuccessful first and partially successful second licensing round have ended up producing an outcome that seems more sustainable than if all the contracts on offer had been immediately awarded to foreign companies as planned. If that had happened, the whole package would have been attacked both for selling Iraqi oil on the cheap and for marginalising the domestic oil industry. In the event, a more balanced picture emerged, even if some of the failed offerings from round one (including Zubayr and West Qurna Phase 1) have since been awarded to foreign companies in separate deals (led by Italian and US firms respectively). In addition to Rumayla which was awarded to a Sino-British consortium in the first round in June, the successful bids in the second round include most notably the supergiant project West Qurna Phase 2 (in Basra; awarded to a consortium led by Russia’s Lukoil and also including Norway’s Statoil in a smaller role) and Majnun (Basra; Shell), plus Halfaya (Maysan; CNPC), Gharraf (Dhi Qar; Petronas), Badra (Kut; Gazprom) and Qayara and Najma (near Mosul, both to Sonangol of Angola). The new agreements also include partnership stakes for Iraqi state oil companies, and the “leftover” fields that were not awarded will be developed by the Iraqis themselves as well (Middle Euphrates, East Baghdad, and a group of fields near Kirkuk). There is a narrative in the international press to the effect that this particular distribution of contracts was a result of international oil companies steering clear of “politically troublesome” areas in north and instead sticking to the “relatively stable south”. While this may perhaps come across as plausible at first glance, it is only partially correct. Karbala, for example, is arguably more loyal to the central government than Basra has ever been; however, no deals were clinched for the fields in that area. Conversely, the so-called “safe” fields in the far south are not without security complications of their own. 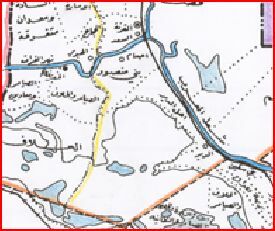 The example of West Qurna underscores this point: The field happens to be situated in what is easily the most troublesome piece of real estate in the Basra area as far as tribal geography is concerned, with the same tribes that created problems for the British in the 1920s remaining influential on the edges of the oilfield today. In other words, the north/south distinction is likely less related to the security dimension than to the geological facts: The truly big oil potential is simply in the deep south. IOCs appear ready to take considerable risks – arguably bigger risks than those involved elsewhere – to get a foothold in this key area of Iraq. Beyond possible security threats at the local level, the involvement of foreign companies is also potentially controversial in governorate-council politics. This is particularly the case with regard to Basra where West Qurna and Majnun are situated. Basra is home to a long-standing regionalist movement which demands improvement in living standards in an area which despite its status as Iraq’s leading oil producer still has a worse infrastructure than the rest of the country, even six years after the fall of the old regime. Last January it became clear that the vision of a standalone federal entity in Basra did not appeal to local interests; however, the decision by the Maliki government in May to set aside 50 cents from each barrel of oil exported from Basra in a separate development fund seems to testify to the continued strength of some kind of local regionalist sentiment. If the Iraqi government keeps it promise to Basra in this regard and is also able to add some jobs reserved for the local population (as has recently been attempted) then the IOCs operating in the area may well hope for frictionless conditions at the governorate level. Conversely, if opposition to the deals inside the South Oil Company should continue (this appeared to be more pronounced during the first licensing round) and jobs and development fail to materialise, then the spectre of Nigeria is not far away given the area’s political traditions. Finally, in terms of Baghdad politics, the reception of these deals is likely to be more or less similar to the situation during the first licensing round, except that perhaps there is a greater acceptance that the fields under offer this time could be more suitable for joint development between Iraqi and foreign firms. The Kurds will remain opposed to anything that strengthens the central government, whereas Fadila may continue to oppose these deals from what seems to be an increasingly opportunistic stance aimed at hurting Maliki for failing to join the Shiite alliance for the next elections – so far at least. On the whole, though, the terms offered to the foreign companies are so modest in terms of per-barrel profit that it seems highly unlikely that any responsible parliament will opt to cancel them altogether in the future. More unclear, however, is the cumulative effect of the deals on the general direction of Maliki’s policies. The totality of the deals with very stringent and ambitious production targets mean many of Iraq’s oilfields will plateau very rapidly and hence bring lots of money to the country in a very short period of time, clearly creating an enhanced potential for corruption and autocracy (as well as disincentives for political reform) at a time when this is exactly what Iraq does not need. In this way – by pretending Iraq is normal when it isn’t – the foreign companies could help bankroll a system of government that will remain rotten at its core until the 2005 constitution has been revised. Similarly, with respect to the Kurdistan dossier, different signals are being sent. Shahristani, the oil minister, will obviously portray the deals as a triumph that serves to emphasise the uneven distribution of oil resources in Iraq and the relative strength of the far south – and therefore will get yet another argument for continuing to ignore the Kurds until they are willing to negotiate (symptomatically, Sinopec was excluded from the second round because of its investment in Addax, which operates in Kurdistan). At the same time, though, Maliki has recently spent more time than normal talking to the Kurds. Under an alternative scenario, one could envisage that the realities of the new situation would finally encourage Kurdish leaders to break free from the maximalist position of figures like Barzani and Hawrami and instead enter serious negotiations with Baghdad. Maliki still does not seem to have made up his mind entirely with regard to potential partners after the elections, and there is no doubt that an alliance with, say, parties like PUK and/or Goran, would make more sense to him than Barzani/Hakim, not least since Maliki would then be in far a better position to maintain his centralist agenda south of Kurdistan. In the immediate future, in terms of the next parliamentary elections now scheduled for 7 March, the net outcome of the licensing rounds is likely to be more of an asset than a liability for Maliki. He will try to sell these deals as achievements much in the way his opponents will try to sell security lapses as examples of his failure. Little wonder then that the Daawa party was among the fiercest opponents to the postponement of the elections. The deadline for registering coalitions for the 2010 parliamentary elections expired in mid-November. But even though all the parties had submitted their lists by then, the Iraqi elections commission, the IHEC, kept postponing the publication of the lists pending the final passage of the election law. However, now the official list has been released. The list contains relatively few surprises. There are only 12 coalitions, of which not more than around 6 seem truly competitive: Kurdistan, Tawafuq, the Iraqi National Alliance, State of Law, Unity of Iraq and Iraqiyya. For these, in turn, the line-up is more or less as expected, even though a few entities remained in doubt about their loyalties until the very end. Eventually, it was Maliki (and not Unity of Iraq) who got the amir of the powerful Rabia tribe of the Tigris on his side; the Iraqi National Alliance, for its part, has managed to enlist the support of the Shaykhi community of Basra. Also, as has been widely reported, the Independent Nationalist Trend of Mahmud al-Mashhadani and Nadim al-Jabiri opted to join Unity of Iraq alongside Wathab Shakir (who at one point was reported as having signed up for the independent Ayad Jamal al-Din); the same list also suffered a defection by Nehro Abd al-Karim who joined Khalaf al-Ulyan and Fadil al-Maliki (a Shiite mujtahid) to form a smaller coalition named the National Unity Alliance. Finally, Iraqiyya has now been confirmed in the shape that everyone has been talking about for weeks: To the Allawi-Mutlak core have been added powerful politicians like Tariq al-Hashimi, Rafi al-Eisawi and Usama al-Nujayfi, plus Tawfiq al-Abbadi, a businessman from Basra, Iskandar Watut from the mid-Euphrates region and Abd al-Karim al-Muhammadawi (the “Lord of the Marshes”, no longer calling himself Hizbollah of Iraq). A more formal launch of this expanded list is still expected to take place. Of these, in turn, only the Kurdistan list is perfectly forthright and clear about its programme. All the others play the now predictable message that they represent all the elements of the Iraqi people from north to south and generally favour a vague programme of “national unity” and “anti-sectarianism”, often backed up by a symbolic parade of tribal chiefs from all parts of the country and religious leaders typically representing even the smallest of these components, such as Chaldean priests or Mandaeans. However, if one probes further, it makes sense to distinguish also between these remaining five coalitions in a number of ways. For example, in addition to the Kurds, both Tawafuq and the Iraqi National Alliance often mix their political message with a focus on ethno-religious sub-identities (Sunni and Shiite respectively); the three others seem to be more determined to avoid this. Similarly, both the Kurds and the National Iraqi Alliance highlight decentralisation as a virtue, and the latter has recently recruited both the pro-federal Turkmeneli party (literally “the land of the Turkmens”; unclear how that will play out with the Kurds!) as well as Fawaz al-Jarba, a Sunni tribal leader of the Shammar who has reportedly expressed an interest in decentralisation more recently (he was also part of the old UIA in 2005 but had been negotiating with Maliki). De-baathification is particularly important for State of Law and the National Iraqi Alliance. In terms of control of the state apparatus, the State of Law is in a unique position, but the Unity of Iraq Alliance also has some influence through the interior ministry. The National Iraq alliance used to be well-entrenched within the system, but after its latest quarrels with Maliki it has sometimes found itself in an unusual alliance with Iraqiyya and the remnants of Tawafuq that increasingly have lost some of the influence which they enjoyed previously when they participated more fully in government. Often overlooked is the fact that the elections commission (IHEC) in practice is owned by the Kurds, the Shiite Islamists and Tawafuq, who effectively control 8 out of 9 commissioners. Iraqiyya is thought to have influence over one member of the commission whereas Unity of Iraq – a relative newcomer – has no representatives in the commission at all. This all makes for a rather complex picture as Iraq moves forward towards the elections, now set for 7 March 2010 according to the latest reports from Baghdad (already changed from 6 March, which was reported earlier today). For voters, the fear must be that post-election coalition-forming becomes so important that few parties are willing to be clear about issues and prospective partners, simply out of fear from alienating anyone. For the United States, the new timeline could be a course of concern, since an election date in March means summer will come closer as a new government is being formed, and Ramadan next year falls in the late summer (around 10 August–10 September), thereby effectively prolonging the period of standstill in Iraqi politics. In a bazaar-style compromise, the Iraqi parliament has kept the best parts of the amended elections law and thrown out the more dubious ones, thereby averting a second veto by Vice President Tariq al-Hashemi. The first veto of the election law by Hashemi caught most observers by surprise. The veto itself was perfectly logical, and, contrary to what the international mass media has written, not particularly sectarian in origin or outlook. It included several elements, but the most important ones focused on procedures for exiled voting (in the media this was misleadingly portrayed as something that catered for Sunnis exclusively). This demand, in turn, was actually addressed by parliament in a very constructive way, since the new procedures – exiled voters will vote according to their “home” governorates – restore the rights of the exiles and put them on more or less the same level as domestic Iraqis. But Hashemi’s big gamble was the possibility that parliament might use the opportunity to pick apart other aspects of the law that they had second thoughts about… Full story here. Today, the Iraqi Islamic Party has published the revised seat distribution according to the second amendment to the election law, given as “seats 2010 (2)” below. There is reason to believe these figures are correctly based on 2005 statistics of the total population (as per the constitutional requirement) instead of registered voters, since the disputed Nineveh/KRG discrepancy is less now: In 2005 the KRG governorates had 15.2% of the governorate seats compared to 8.3% for Nineveh; in this apportionment the three Kurdish governorates have been reduced to 13.7% whereas Nineveh has been increased to 9.7%. In other words, the negative impact of the second amendment on the Sunni-majority areas is less than some feared in the immediate wake of its passage in parliament. Nevertheless, there is a desire among local leaders both in the north and the south (which also stand to lose to Baghdad under the new arrangement) to hold on to the quotas acquired in the first apportionment based on up-to-date statistics, and there is currently talk about expanding the total seats to 325 to allow for one extra seat for Sulaymaniyya and Dahuk, and to otherwise revert to the quotas based on the 2009 statistics. At any rate, the release of these figures is helpful to the debate in terms of identifying and assessing the remaining points of controversy. Two problems with the IIP press release: Anbar is not mentioned. Presumably it keeps its 14 seats. Second, that means the total of seats is 307, as per the first apportionment. Except that the second amendment has stipulated 5% compensatory seats plus 8 minority seats, which would seem to mean a new total of 331 seats unless the minority seats are taken from the compensatory quota, as under the first version of the amended law [or the minority seats can be taken from the governorate seats, as explained in comment no. 3 below]. Anbar 9 11 14 15 14? Subtotals 230 230 307 299 307? Total 275 275 323 323 323? Where Are the Ministry of Trade Statistics? Two serious misperceptions continue to dominate the Iraqi debate about the amendments to the election law and seem to play a role in making the row over a possible second presidential veto unduly heated. The first is the idea that Iraqi exiles somehow lost a quota of reserved seats as a result of the first veto. This is incorrect. Under the old system, the exiles never had a quota. (Nor would they have got one in the first iteration of the bill or, for that matter, under Tariq al-Hashemi’s proposed alternative.) Rather, whereas domestic voters had their vote counted twice – first at the governorate level and then in the field of compensatory seats – the vote of the exile only counted towards the compensatory seats, along with all of the domestic votes. It would be more correct to think of this as domestic voters voting twice, first in their governorate and afterwards in the 45-seat (2005) national constituency. Exiles voted only in the small national constituency (where their vote of course carried exactly the same weight as that of any other Iraqi citizen) and were thus clearly second-class citizens. Accordingly, the new arrangements should be hailed as a big and unequivocal step forward for the exiles and should not prove an obstacle towards ratification of the bill. The second problem concerns the distribution of seats between governorates. In the media, one can get the impression that the exact distribution formula of 2005 will be used. This is again incorrect. It cannot be used, because the Iraqi federal supreme court has ruled that it was unconstitutional since it was based on registered voters and not on total population (and therefore covered only around 14 million of Iraq’s 27 million plus inhabitants). In fact, Michael Hanna has argued convincingly that the ruling means the new amendments could be unconstitutional too, since they insist on going back to the 2005 statistics instead of using more recent statistics when these are in fact available. At any rate, as a minimum, the IHEC will now have to use 2005 statistics that reflect total population (and not registered voters) as a basis for distributing the seats between governorates. Crucially, this distribution is widely expected to be different than the 2005 distribution based on registered voters, because voters are thought to have been under-registered in many Sunni governorates back then due to the insurgency. In times of crisis and when tempers flare bureaucracies can provide safe havens. The Kurds have already decided they did not like the ministry of trade statistics for 2009 as a basis for distributing parliamentary seats because they thought some of the figures were “unreliable”. (It cannot escape mention that they also insisted on using them for the voter rolls in Kirkuk due to their high reliability.) So while we are waiting for the ministry to dig up the 2005 statistics, why not have a look at statistics produced by another Iraqi institution, just for the sake of the argument? The Iraqi statistics bureau happens to be part of the ministry of planning which in turn has been controlled since 2006 by Ali Baban, himself a Kurd. Their numbers are of course only estimates, based on the 1997 census. But by looking at the estimates for 2004 and 2007 and the different growth rates, it seems clear that some attempt has been made to account for regional variations across Iraq caused by factors such as migration. No note on methodology accompanies these statistics but even if the logic may seem impenetrable (and the zero growth in Salahaddin comes across as particularly suspect) there seems to have been an attempt at creating estimates that account for uneven growth in the post-2003 period (“growth % 2004–2007” below). It should be stressed over and again that these are not the coveted ministry of trade statistics (and the above is a back-of-an-envelope calculation). But still, these are numbers produced by yet another Iraqi ministry that just like the trade ministry cannot plausibly be suspected of harbouring any hidden Sunni Arab conspiracy against the Kurds. And yet just like the MOT statistics they seem to suggest that the Kurdistan share of seats in 2005 was higher than it should have been if the federal supreme court principle of using total population statistics had been adhered to. The question today is why the MOT statistics cannot be released into the public domain. Were the Kurds unaware of the federal supreme court ruling and did they think the 2005 distribution key was guaranteed? Are there complications between Sunni leaders and especially between Tariq al-Hashemi (who now is aligned with the nationalist Allawi/Mutlak/Isawi/Nujayfi bloc) and the Tawafuq alliance (which authored the original complaint to the federal supreme court but has been critical of the veto)? In the absence of the statistics we have backroom deals that risk producing arrangements that are unconstitutional from day one, and a shouting match about constitutionality by people who clearly don’t know what’s in the Iraqi constitution. Today some even claimed the veto deadline had expired, even though Hashemi said publicly on 25 November that he had not formally received the amended bill. In February 2008, 13 days lapsed from the adoption of the provincial powers bill to the veto by Adil Abd al-Mahdi. It now seems everyone is looking towards Sunday (which is a day off in parts of Iraq due to Eid al-Ghadir, a Shiite holiday). Regardless of what these statistics may turn out to actually say about the populations of Nineveh and Kurdistan in 2005, it would have been a great advantage if they could have formed part of the public discussion about the Iraqi election law. *Compared with the ministry of trade statistics for 2009 one does get the impression that the internal balance between the three Kurdish governorates should be adjusted, but the totals make sense. As the Obama administration moves closer to announcing its new Afghanistan policy – widely expected to involve a substantial infusion of thousands of additional US troops – competing interpretations of the effect of a similar policy in Iraq between 2007 and 2009 continue to abound. According to the optimistic Iraq narrative, the “surge” of US troops that was implemented in Iraq from 2007 onwards created the right environment for political progress in the country. That progress was allegedly reflected in more mature forms of voter behaviour in the January 2009 local elections in Iraq, and further gains are expected in the parliamentary elections next year in the shape of political development towards a form of politics that is issue-based rather than ethno-sectarian in character. However, a more sceptical interpretation is also possible. It can be argued that the optimistic narrative on the “surge” exaggerates not only the permanence and irreversibility of the assumed changes in the political situation in Iraq in the period between 2007 and 2009, but also the degree of American agency in bringing about what limited progress was achieved. The criticism is not that the US soldiers did not do their job of creating a more permissive environment; rather the argument is that the political and diplomatic effort failed. Some of the points that form the basis of this second and more sceptical interpretation have already been rehearsed many times with regard to the situation in the Anbar governorate and need not be repeated here. Chiefly, they focus on both the chronology of events (the Sunni turn against al-Qaeda antedated the “surge”) as well as the absence of permanent political progress (the Anbar-centric part of the story emphasises the lack of post-awakening integration of the sahwa into the Iraqi government security forces). However, when it comes to developments in both Mosul and the capital Baghdad – arguably areas that are more important to the country as a whole – the true chart of the highs and lows of political progress following the “surge” has yet to receive the attention it deserves. Indeed, there is reason to ask whether the United States government ever understood the nature and the timing of the limited and temporary progress that did in fact take place. A good starting point for this discussion is the January 2009 local elections, where Maliki’s performance is routinely overrated in US diplomatic circles. All too often overlooked is the fact that Maliki’s State of Law coalition at that point remained Daawa-dominated and that it performed dismally in Sunni-dominated areas outside Baghdad. Instead, Maliki’s finest moment actually came in the two first months subsequent to the announcement of the results. During this period he took meaningful steps towards building local alliances across Iraq where he did indeed transcend his traditional Shiite Islamist base, reaching out to Sunni and nationalist forces such as Iraqiyya, Hiwar and the sahwa in places like Anbar and Diyala (forming the opposition in the latter place). There even seemed to be good relations with local politicians in Nineveh, the most populous of Iraq’s Sunni-majority governorates but also an area which for a long time seemed to receive less attention from Washington than Anbar. Importantly, Maliki had a brave ideological message ready at hand to accompany these overtures: For the first time since 2003, an Iraqi Shiite politician publicly said there were problems with the 2005 constitution and the way it was adopted, that there had to be limits to federalism and decentralisation and concessions to the Kurds more generally, and that an exaggerated focus on ethno-sectarian consensus (tawafuqiyya) could bring politics in Iraq to complete paralysis. These were themes Maliki had been floating since late 2008 (many of them originated with the 22 July front of opposition parties that secured a timeline for the local elections but generally was cold-shouldered by Washington), but this was the first time he actually moved to create political alliances to back them up. In this way, meaningful pacts were forged between Shiite politicians and secularists and Sunni leaders who had greater popular backing than the Tawafuq affiliates that had served as “Sunni” figureheads in Maliki’s government since 2006. It should be stressed that this progress had nothing whatsoever to do with the message that Washington had been hammering on with relentlessly for the past six years about a “deal” that should be struck “between Sunnis and Shiites” to settle “fundamental” issues such as those relating to “oil revenue”. Rather, the liberating effect was created by ideas of Iraqi origin and a political atmosphere when Iraqis for a moment forgot about these categories altogether and focused on being Iraqis first. Subsequently, a number of scenarios of promising alliances for the next parliamentary elections were discussed: Maliki-Mutlak, Maliki-Allawi, Maliki-Bulani, Maliki-Abu Risha, Maliki-Nujayfi and even Maliki-Mashhadani/Jabiri. However, no institutional change could be achieved at this point since Iraq was still hostage to the anachronistically composed parliament that had been elected in a very sectarian atmosphere back in 2005. Alas, this progress proved short-lived and was reversed only one month later. Maliki’s downturn began in April, when he came under double pressure from parliament (which pressed ahead with electing Ayad al-Samarraie as speaker), and, apparently, from Iran (which seems to have played a role in pressing for a stronger role in ISCI in the local councils south of Baghdad than was strictly speaking necessary based on the election results alone). ISCI, for its part, turned up pressure on Maliki by attacking his tentative alliances with Sunnis and secularists as a “dangerous return of the Baath”, and a number of unexplained explosions – partly in areas considered as Shiite heartland and therefore out of reach to Sunni insurgents – added to Maliki’s burdens. The prospect of a Mutlak-Maliki alliance was one early casualty of these developments. For a while Maliki resisted pressure from Iran and ISCI to join an all-Shiite alliance for the next parliamentary elections, even as efforts in this direction intensified in late July and August. The Shiite alliance was declared in late August without Maliki on board; on 1 October Maliki announced his own alliance, separate from the other Shiites. However, the nature of the new alliance, while clearly superior to the ISCI-led project in terms of genuine cross-sectarian coalition-building, was but a pale shadow of the powerful alliances that had been foreshadowed only six months earlier, with none of the leading Sunni or nationalist politicians aboard. Whereas Maliki had managed to maintain his independence from ISCI throughout this difficult period, it was becoming increasingly clear that the pressure was intensifying and was taking its toll. After the first ministry bombings on 19 August, just days before the planned announcement of the Shiite alliance, Maliki’s public statements grew increasingly hostile to neighbouring Arab states, and more and more paranoid with respect to the “danger” of a return of the Baath (with respect to this latter issue he actually fast became more ISCI than ISCI itself). And whereas media outlets close to Maliki continued to produce materials bitterly critical of ISCI and even Iran for some weeks, this tendency seemed to be reversed quite markedly after the second ministry bombings on 25 October (over the past few weeks, some of the materials critical of Iran have simply been deleted from pro-Maliki websites and the campaign against the Buratha news agency and Jalal al-Din al-Saghir, the ISCI preacher, has receded). Lately, talk of a future coalition with the Shiite alliance and the Kurds has once more come to the forefront (inevitably all the unwed brides of the aborted coalition projects involving Maliki are now looking somewhat more sectarian as well), and with the recent fudge on Kirkuk and the subsequent parliamentary dispute over the exiled vote in the election law, the alliance structure of Iraqi politics suddenly looks remarkably similar to the situation in 2005, leaving profound questions as to whether the “surge” had any lasting effect in terms of political maturation at all. For a long time, analysts were in the dark as to what exactly constituted US policy in Iraq in this critical period, which coincided with the first months of the Obama presidency. We now know. Thanks to a long interview with Vice-President Joe Biden in the New York Times, the rationale behind his two missions to Iraq in July and September as well as the general outline of US policy on Iraq over the past six months are becoming a lot clearer. In essence, the aims have been to keep the parliamentary election schedule on track as well as dealing with the “danger of Arab–Kurdish confrontation”, which became a hot topic in Washington think-tank circles last winter. With respect to the latter, in theory, at least, the Kurds were supposed to back down from their maximalist demands on issues like Kirkuk and disputed territories more generally; Maliki, for his part, was gently encouraged to visit Kurdistan and meet with Kurdish leaders in order to create rapprochement and a semblance of normalcy. This new information should enable us to summarise the US political and diplomatic input in the window of real political progress that existed in the first half of 2009. In general, while the focus on the upcoming elections is obviously laudable as such, the attempts to intervene in the internal Iraqi power struggle do not seem to have produced results that are consonant with the declared ideal of generating political maturation. In fact, far from supporting a trend towards greater degree of cross-sectarian politics (i.e. in the sense of transcending ethno-sectarian identities), the net contribution by the Americans has been to enable a tentative restoration of an old alliance explicitly defined in ethno-sectarian terms between Kurds and Shiite Islamists, with or without Tawafuq as a pliant “Sunni” appendage – in other words, a set-up that will serve to freeze those identity categories instead. Back in April, Washington applauded the blow to Maliki that was brought about by the election of Ayad al-Samarraie as parliamentary speaker, apparently fearing any other outcome would create too much concentration of power in Maliki’s own hands. Similarly, whereas his tendency of challenging ISCI’s concessions to the Kurds had won him important new friends outside his core constituency of Shiite Islamists, we now understand that American pressure played a role in Maliki’s choice to dampen down his erstwhile criticism of Kurdish policies during last summer – a tendency which effectively deprived him of support in key Sunni areas like Mosul, where critical questions were asked after Maliki’s visit to Kurdistan and his lack of a clear position on the idea of joint patrols in the so-called “disputed territories”, and where the promising prospect of an alliance with Hadba leaders probably died out as a consequence. For the past months, criticism of Kurdish maximalism from people close to Maliki has been mostly limited to Hussein al-Shahristani and Abd al-Hadi al-Hassani (related to the oil sector) and Abbas al-Bayati (in the context of Kirkuk). The Kurds, for their part – at least according to American theories – were supposed to modify their demands. On this, the US goals were indeed clear and progressive in the sense that they seemed aimed at a meaningful compromise: According to the NYT interview, “Biden told me that the Kurds were not yet prepared to make the concessions over Kirkuk that they would have to make…The United States would not support Barzani if he insisted on a referendum either on Article 140 or on the Kurdish Constitution [emphasis added].” In practice, though, the impact of this kind of pressure on the Kurds appears to have been minimal. In fact, Biden also said in the interview that he “understood” why Barzani could not make the required concessions! Accordingly, the Kurds stuck to their position quite relentlessly during the drafting of the first iteration of the election law and only changed their mind when the “special status” accorded to Kirkuk was so convoluted that it verged on meaninglessness; they subsequently felt no inhibitions in pressing for further privileges when the Hashemi veto came up for debate. Barzani has been his usual self throughout, with recent calls for a separate Kurdish army and independent Kurdish oil exports circumventing Baghdad entirely. Only Maliki has been a lot quieter than normal, apparently sticking to his part in the Biden script. Similarly, at the diplomatic level in the wider region, Washington seems to have done little to induce neighbouring states to support genuine cross-sectarian coalition-building in Iraq. The obvious Iranian role in shaping the new Shiite-led alliance intensified during the summer, but few effective counter-measures appear to have been taken. Instead, rumours had it that there was a Saudi role involved in botching the last remaining promising alliance options in September and October (i.e. 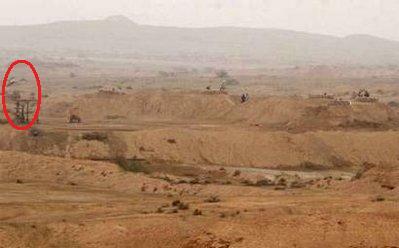 between Maliki and Bulani/Abu Risha). And instead of building on the obvious leverage that exists in relation to the Iraqi wish for cancellation of debt to Kuwait and Saudi Arabia, Washington has passively seen Saudi foreign policy deteriorate into a partly imagined surrogate fight with Iran in Yemen at a time when it could instead have been focused on Iraq and conducting tough diplomacy to stem a far more palpable Iranian challenge. For their part, the smaller Gulf emirates have been most prominent in pumping money into the nascent Kurdish economy including the oil sector, thereby effectively providing Arbil with extra leverage vis-à-vis Baghdad. Lately, a Ras al-Khaima-based company that also includes Saudi owners alongside Emiratis has come to the fore through its investments in foreign oil companies operating in Kurdistan. The EU countries have generally followed suit, with active bilateral policies towards the Kurdish regional authorities also involving the opening of consulates and high-level visits. What this all suggests is that the main problem in the Iraq “surge” was never related to military hardware at all but rather to deep epistemological issues. Through insisting on dealing with Iraq through ethno-sectarian lenses instead of adopting a genuinely post-sectarian approach, Washington has contributed to reifying those very political cleavages that the “surge” was supposed to transcend. Through focusing on the formalities of getting an election law passed without causing too much Iraqi nationalist excitement over Kirkuk, the Obama administration does not appear to have realised how much momentum related to political development and maturation was lost during the Iraq policy vacuum in the first part of 2009. In Washington, Iraqi nationalism is ignored at best and seen as harmful by some; as a consequence what is coming to the forefront in Iraq has the appearance of a Turco-Kurdish-Iranian project far more than an American-Iraqi one. While this may seem consonant with earlier ideas articulated by Biden about “regionalising” the conflict, it remains in stark contrast to the declared intention of the Obama administration to focus on Iraqi territorial integrity and unity. Unless Maliki wakes up and realises that he may end up being marginalised entirely by the other Shiite Islamists and the Kurds (who have always been sceptical about him and his centralism), it is hard to see how this trend can be reversed. The obvious question as far as Afghanistan is concerned is whether the outlook there is any better. Does it matter whether the added troops are 10,000 or 30,000 if the US is incapable of comprehending the basic political dynamics in the country? Anecdotal and superficial evidence may tentatively suggest that a centralised form of government could be as inappropriate in Afghanistan as symmetrical federalism is in Iraq. What about the ethnic and religious groups – are they truly seeking the kind of “compact” defined in ethno-sectarian terms that Washington for six years straight has tried to enforce on unwilling Iraqis who by and large want to transcend these categories instead? And there is of course the question of the regional environment, where the irony in Iraq was that Iraqi nationalism among the Shiites at the popular level was marginalised by US insistence on working with and empowering the most pro-Iranian groups among the Iraqi political elite. More realistically speaking, with regard to Iraq it seems that there is now intellectual resignation and a feeling that time is running out in Washington, with a concomitant emphasis on simply spinning the US mission there as a success rather than getting it right. In Afghanistan, there may be more time available, but unless there is a serious and informed debate about the suitability of the state structures that were created with US sponsorship in the post-2001 period, no amount of carefully planned counter-insurgency can save the situation and create stability in the long term.